Stevensville, MD – Miltec UV, USA. The Department of Transportation Federal Aviation Administration awarded Miltec UV owner and founder, Joseph B. Blandford, Jr. 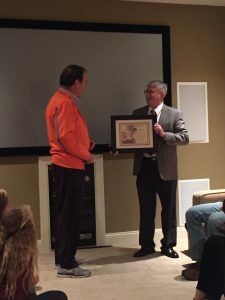 The Wright Brothers “Master Pilot” Award on November 26, 2016. 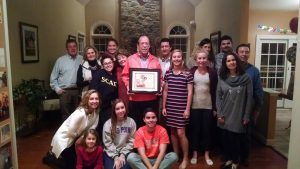 Mr. Blandford was presented the award by Greg Travis of the FAA while surrounded by his wife, children and grandchildren. This award is the most prestigious award the FAA issues to pilots certified under Title 14 of the Code of Federal Regulations (14 CFR) part 61. The award recognizes those who have exhibited aviation expertise, skill and professionalism for at least 50 years while piloting aircraft as “Master Pilots”. Joe Blandford’s love for aviation started at a very young age. Growing up, he lived very close to the Greenville Army Air Base in South Carolina. It was through the association with the base, and its personnel, that he was introduced to airplanes and various aspects of aviation. Upon entering Clemson in 1954, Joe signed up for the Air Force R.O.T.C. He took his first jet flight in a North American T-33 and was hooked. In 1957 he joined the Clemson Aero Club, a group of aviation enthusiasts, where he had his first solo flight on September 23, 1957. From the first solo, things progresses fairly quickly. Joe continued to fly with the Clemson Aero Club until he entered the US Air Force in September 1958. He completed Air Force flight training in May, 1959 and was assigned to Wright Patterson AFB in Ohio. Joe was married to Marilyn Blandford on June 13, 1959 and they raised 4 children. He and his family ended up moving to Arnold, MD in the summer of 1968. Joe wanted a plane for business trips and met a gentleman that wanted to learn to fly, so in the spring of 1970, Joe and R.C. Preacher Whitner bought a Piper Cherokee Arrow, N3892T together. They had the plane until 1972. Joe continued to fly the planes of various friends including those of his Guardian Angel, Bob Busch, for almost 5 years. In 1985, he purchased a Bellanca Super Viking, 17-30, N6658V and flew it until 1987. In November 1988 he bought a 1972 Bellanca 17-30A Super Viking, N1JJ which both he and his son Bob flew quite a bit until August 1992 when they traded it on a Piper PA-34-200T Seneca II, N1101X. They kept the Piper through 2 engine changes, until they sold it in February, 2016. Joe decided to take up another phase of flying in November 1999, and joined the Rose City Soaring Association in Thomasville, GA. He added Gliders to his Commercial Certificate and his CFI Certificate in November 2004. Most of his glider flying has been giving instruction flights in the SGS 2-33A and K-13. In late 2013, Joe became a pilot for Angel Flight, an organization that provides voluntary free air travel service to needy persons in need of medical, compassionate, disaster relief, and other types of transportation services. He has had some wonderful experiences with these flights. Joe also went to Winter Haven, FL to get his Seaplane rating (this was a gift from his wife Marilyn). He spent the weekend flying with friends and in February 2012, they graduated with their Single Engine Sea Ratings. Joe has thoroughly enjoyed his aviation career and has met many interesting people as a result of his involvement in the aviation community. He currently owns a Piper Seneca IV that he plans to fly for many years to come! Miltec UV has been servicing the UV industry for over 26 years and is a global leader and manufacturer of both arc and microwave ultraviolet curing systems. Miltec offers a wide range of quality UV parts, standard equipment and custom systems and services designed to interface with existing or new manufacturing production lines. These systems serve a broad diversity of industry-specific applications and market segments. Among the many applications supported are: optical fiber, wire, metal decorating, wood flooring, cabinets, automotive products and many other industries.